We wanted Hailey and Evan to have a playhouse for Christmas so Steve and his Dad started to build it while Steve has time in between jobs. Steve was more than glad to have his Dad help him. These types of projects always take longer than you think; another reason to start early. Steve came up with the design and really wanted a tower with a steep roof. Steve is particular about what he wants. He insisted on stained wood floors. Poor Hailey caught a nasty stomach bug from Church and was sick and feeling horrible. We made a couple of trips up to Steve's parents' house. It helps that his dad has all sort of tools and saws that we don't own. Hailey has lots of small figurines and fairies that will soon reside in this mansion. 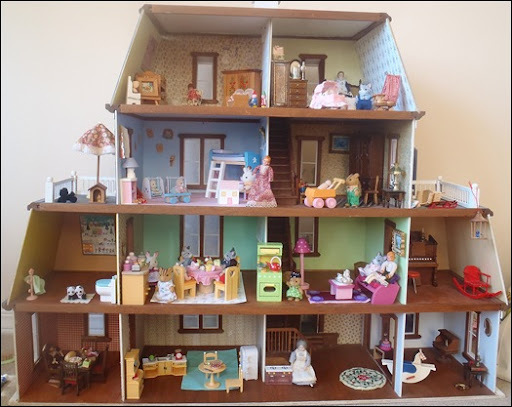 I specifically wanted a house that had smaller rooms and did not want a Barbie doll house. Despite the fact that most kids her age already have Barbie dolls, I just don't want her to have any this young. We are going to get some "Calico Critters" to put in our house. Hailey loves animals so this is perfect. 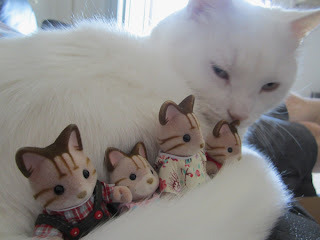 For some reason not only do the Calico Critters animals seem more innocent, but I am convinced Barbie will teach Hailey to play hookie. Hailey is obsessed with cats, so she will most likely get a cat family, but with so many rooms they can have friends who are porcupines, squirrels, rabbits, mice or many other animals. Even Hailey put her two cents in. This is Steve at 2:00 in the morning busy painting. Steve is going to cut out wooden window frames with panes to go around all the windows, and wooden shutters for the outside windows. When we finally get this home we are going to have to hide it in the garage for a few months until Santa comes. My guess is the little LEGO men are going to have to fight to get a spot in the tower. Funniest thing ever. If looks could kill..... that would be when Steve told his Dad he had crown molding for ALL the rooms that needed to be cut! This is just the beginning. Steve hasn't cut the decorative dormer windows for the taller roof yet. There is still a lot of painting to do, and molding to glue in, but it's looking pretty awesome for only 2 days work so far. Oh, I wish I could put him in a jar and keep him this age forever. Evan fell asleep sitting in his Bumbo. So sleepy! Steve is much more comfortable than that Bumbo. We have been playing Small World and Dominion lately. It's been a while since we've had friends over to play with but, ah well, someone will take us up on it sometime. In the meantime we'll occasionally break out the games for just the 2 of us. He likes the little mirror on top of the swing.